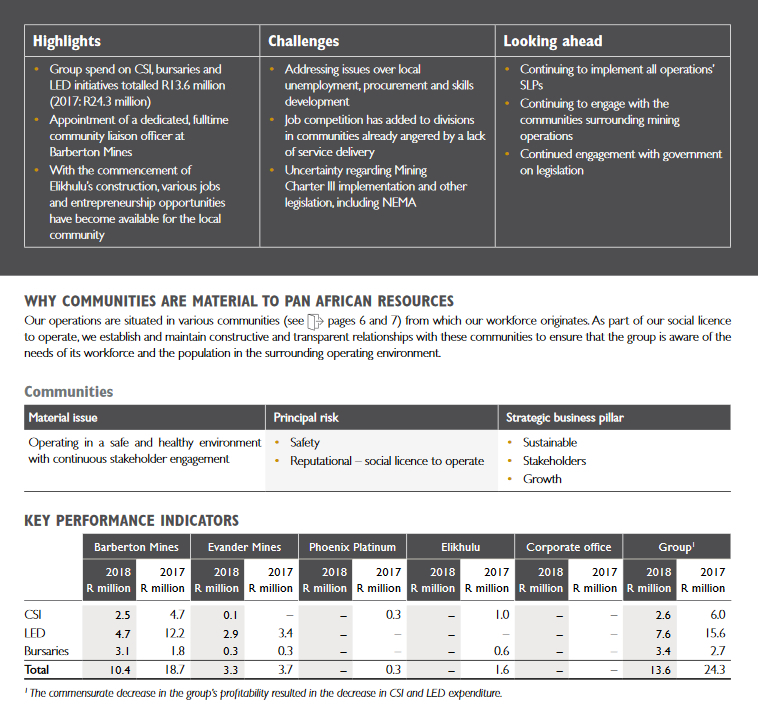 Pan African Resources endeavours to boost opportunities for local communities while curtailing adverse social impacts our mining operations may trigger. We monitor, measure and manage the social and economic impacts created by our operations in line with our approved social and labour plans. • proactively building relationships with local leaders and ward councillors at the mines. In terms of the MPRDA, mines are required to develop and implement comprehensive SLPs, human resources development programmes, mine community development plans, a housing and living conditions plan, employment equity plan, and other processes to save jobs and manage downscaling and/or closure. We annually submit these progress reports to the DMR. We continue to drive various community-focused development projects in the areas around our operations. The group also promotes responsible supply-chain management by encouraging our suppliers to support LED where possible. To minimise any negative social impacts from our mining operations, we monitor, measure and manage our social and economic impact in line with approved SLPs.